Buying picnic ingredients and walking to a park or nearby piazza to enjoy them is the best way to save money dining in Italy. The country is full of small stores where you can purchase salami, ham, cheese, great breads, and wine or water for far less than you'd pay in a restaurant. If you've taken the "slow travel" route and have rented an apartment or country house for a week or so, you might feel like putting together a snack or a small meal to enjoy on the terrace. Grocery shopping in Italy is very simple, but it's different in some small but important ways. This photo of the open air market in Fivizzano, a town in Italy's Lunigiana region, shows people doing something that's considered very, very bad if you don't have permission. Can you guess what it is? It's always a treat to walk the streets of any large town or city and see fresh, colorful fruits and vegetables spilling from tables and bins along the way. 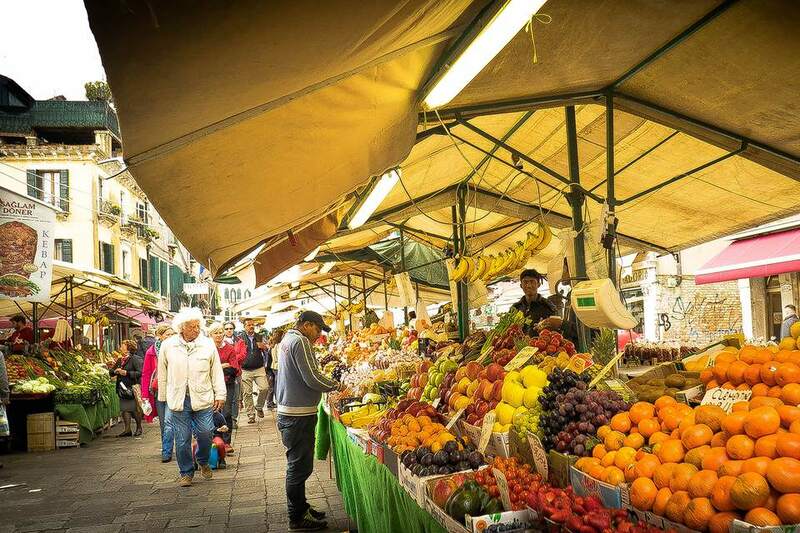 This picture shows a small Frutta e Verdura – a fruit and vegetable market – in Milan. Approach the shopkeeper instead and say "Buon giorno" (good day) or "Buona sera" (good evening). Then explain exactly what you'd like to buy. The shopkeeper may motion for you to help yourself or he may give you a bag – you can take this as permission to help yourself. This doesn't mean that the shopkeeper wants to see you rooting through the bin tossing your rejects hither and yon, however. You're expected to carefully select and touch only those items you wish to buy unless there's obviously something wrong with them. It's all about hygiene. "Un chilo di mele, per favore" means you want a kilo (2.2 pounds) of apples, please. "Tre pere, per favore" means "Three pears, please." If you want ripe ones to eat today, you might add "per mangiare oggi, per favore" – "to eat today, please." You can point to the bin and use hand signals if you don't know the language. Hand signals are different in Italy than in many other places around the world. "One" is signified by raising your thumb as though you were hitchhiking. "Two" uses the thumb and index finger. Then you just add fingers until you run out. Find a plastic bag for your purchase. Fill it with the item(s) you want to purchase. Look for and remember the code on the label of the bin you've selected the items from. Place your bag on the scale and push the button that corresponds to the code – it's usually a number. Wait for a printed sticker to pop out from the scale and paste it on the bag. You're all set! And you did it without uttering a word of Italian! If you don't follow this procedure, the checker will have to do it for you when you check out. This doesn't please the people who are waiting behind you in line. Another thing that's different in Italian supermarkets is that you might have to pay a small amount for a bag in which to carry your purchases. After the items are scanned at the cash register, they're shoved into a holding area where you're expected to bag them yourself. This is best accomplished with two people – one to bag and the other to try to figure out how much to pay. Paying isn't always as easy as holding out a bill larger than what you think you owe because Italy is chronically short of small change so the checker is likely to badger you for your coins. Some enormous Italian supermarkets also charge 1 euro for a cart. You'll need a 1 euro coin to free the cart so you can push it around the store. This is not true of small supermarkets in Italy, however. In fact, I've never had to pay for using a cart. Small shops and stalls at open air markets don't usually require that you wear gloves, but they do expect you to ask for the items you wish to purchase. This picture shows carciofi or artichokes. They're priced by the piece, one for .59 euro and five for 2.50 euros. Many produce items are priced by the chilo or kilogram, which represents 2.2 pounds. A tenth of a kilogram is indicated by an etto. The plural is etti. If you're thinking, "It'll be easier to go to the supermarket to buy vegetables," you're probably right. On the other hand, even pausing to look at the produce in the market will at least tell you the Italian words for the items – and as a bonus, you can search Italian menus for your favorites and you'll know what's fresh if you remember what you've learned. The best restaurants for value often don't have English menus, and some don't have menus at all – they just tell you what they're cooking that day. You'll find a dazzling array of cured meat products in any of these stores – hundreds of types of salami are found in Italy. When you've located the meat you want, your next challenge is to determine how much you'll need. A kilogram is way too much for two people on a picnic. An etto is just about right for a couple – just under a quarter pound. When the owner holds up the salami and asks, "Quanto?" you can reply, "Un etto, per favore" – or if you're really hungry, "Due etti, per favore." An excursion into the larger fish markets can be an eye-opening experience. Cagliari in Sardinia devotes a whole floor of its covered market to fish. The number of things that come from the sea around Sardinia is amazing. Just don't get in the way of real commerce if you're rubbernecking the markets.